In this white paper Andy Billingham discusses how new demands in the area of industrial security drive a continuous development process in tandem with new materials and production technologies. He suggests these demands may be most easily categorised as: very low level; general access limited and equipment protection needed; restricted access and equipment protection; higher risk or value; very high risk/value. The global HVAC industry is rapidly changing with a trend to natural refrigeration systems, although these still need controls and compartments. Such systems match the needs of a growing building industry worldwide including stores and offices with a parallel demand for large HVAC installations. This, together with constant upgrading of old systems with more efficient, lower energy equipment, means that the specialist hardware for HVAC packages is in increasing demand. Andy Billingham discusses the importance of security to data centres, colocation facilities and technical data repositories. Clearly it is essential that you safeguard sensitive information from physical theft, hacking, data breaches and human error. This article is intended to help you strengthen your security strategy and identifies and explains 5 important considerations that will help Data Centre Managers protect their data centre. Andy Billingham discusses the way developments in enclosure hardware which have occurred since the Millennium, where the feedback over those years from development products to keep pace with industrial needs, has driven the availability of ubiquitous items like quarter-turn locks and latches and on to multi-level Biometric access systems. This whitepaper is a must read for managers of small data centres as it addresses the issues involved in physical protection of valuable or sensitive data, right down to the level of a single server cabinet. Discusses how a range of advanced technologies have come together under the EMKA umbrella to meet the needs of applications as diverse as Data Security and vehicle manufacturers – which nonetheless share many common areas of background expertise. “How secure is secure?” This is the million dollar question … or literally, the 7.2 million dollar question – currently considered the average cost for a data security breach. EMKA BioLock cabinet security is able to protect at this level. Describes the compliance environment and how the installation of biometric technology at the cabinet can assist in meeting the security requirements of Data Centres world wide. A piece describing how networked biometric lock technology based at the cabinet can protect from internal threats of server hardware and data theft while providing an absolute audit trail. This whitepaper sheds light on the extrusion processes and terminology used for the benefit of specifiers looking for standard or custom extruded profiles. An overview of the materials and specifications commonly found in dealing with extruded sealing profiles. Detailed information regarding the various materials used, their properties and the various national and international testing methods and standards relevant to sealing profiles. Covers the many structural concerns in the specification and installation of gasket sealing profiles. Describes the continued development of locking systems for specialist enclosures. Swinghandles – a customer/manufacturer design interaction. Published June 2011. Compression lock technology has seemed to be rather confined to a limited range of applications until it recently came out of patent protection and now a much wider market is finding it beneficial. For most banks of today it’s not enough to have a burglar proof safe. What happens if unforeseen events come about? And who – for instance – has to supervise the flow of control data for the building service. Mechatronics is a term perhaps most associated with automotive applications. In reality, however, mechatronic solutions are found in almost all areas. Thanks to EMKA this is now increasingly true for the security of switch cabinets. The first 20 years of EMKA and its products in the UK. The rational for 1/4 turn locks – compared to threaded fasteners or L and T handles. Describes technology developments in locks, handles, hinges and gaskets. Development of the modular approach to enclosure hardware. 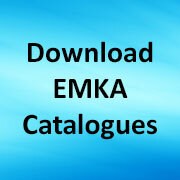 Share the post "White papers from EMKA UK"